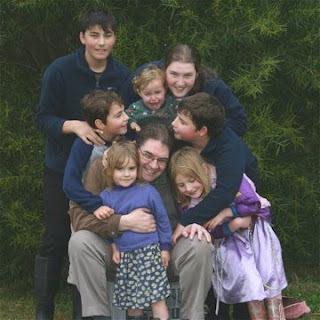 Our seven children have the same Mum and Dad, yet they are all very different. On Saturday I returned from shopping and all the children rushed out to see what I had bought. Clare quickly picked out a pack of 100's and 1000's. These are coloured sugar sprinkles which when spread on buttered bread make "Fairy Bread". "Yes!" Clare cried out, "This is JUST what we need!" Meanwhile Rose had discovered the corn. "Corn!" she cried, rushing inside with the pack to show Lana, "Yummy!" 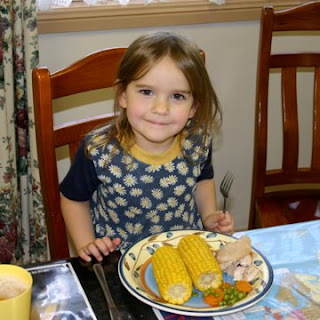 This is a picture of her with TWO cobs of corn and no chips as she prefers the corn - as we have shown before. Ariel and Eric accompanied me shopping and were able to "influence" my purchasing decisions. This time we bought quite a lot of chocolate and lollies to share with the American pilgrims that will be staying with us in 10 days time preparing for World Youth Day. So Ariel got her preference of sweet things. James and Peter were happy I bought fruit. And Lana was really happy she didn't go shopping! So wins all round. 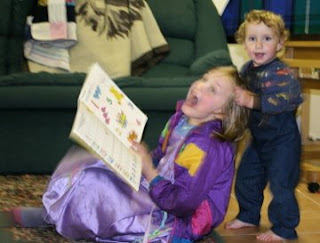 We have written before about the eleventh reason to have another child: Because they are funny. Martin has been the cause of our amusement yesterday. We went to vigil Mass (Mass at 6:00pm on Saturday) which is normally a bit of a challenge as the children are more fidgety in the evenings. This time Martin was very impressed with the sign of peace which is shaking the hand of a neighbouring person in the congregation and saying "Peace be with you". Not long after this we have the Consecration and then we process to receive communion. The local parish church is quite small so all those going to communion must be in single file. And Martin offered his hand to every one to either shake their hand or give him a high five! He found it very entertaining! When Eric tried to quiten Martin down, he told him "Shhhh." So Martin responded by loudly going "Ssssssss! ", defeating the purpose. The other thing he has decided to do is to look at one of us and put his hands on his head. We then copy. 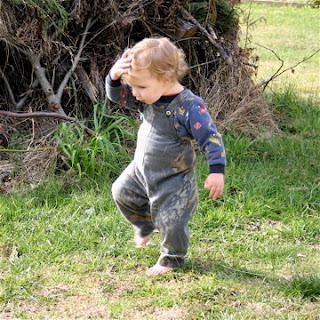 He then dances up and down on one spot with various assorted grunts and enthusiastic squeals. We then copy that too. Then he stops, grins and laughs and it all begins again. The first photo is part of his dance with one hand on his head. The second photo here is him saying "Ha Ha Ha" to us, very proud of his efforts. It is amazing how much Martin can communicate through the one sound with varying inflections. I can't even write down the word he uses. Normally this would be represented in a novel by the characters saying "?" This one "?" sound can mean hello, I don't understand, good morning and so on. One of our older Windows PCs broke down again recently. 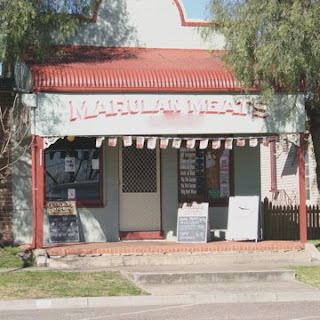 The local place we normally use to get PCs fixed is no longer in business, so Lana asked at the local butcher if they knew what was happening. Well, one of the fellows that was assisting happens to run a computer repair business on the side and was able to help. So Lana dropped in the computer yesterday - at the butcher shop! The owner of the shop expressed surprise when Lana opened the door and Eric walked in carrying the PC case. Then one of the butchers called out to the fellow, "The computer is here!" "Oh, Good," he said coming in from the back of the store. So there you go. When you're in the country, and petrol prices are running at around $1.80 per litre ($7.35US per gallon) you do all sorts of things to cut the driving and fuel costs. Like dropping of your computer at the Butcher shop for the computer man to pick up. Obvious really. It has been some time since we displayed any of the cratfy things Lana has done. In fact, we haven't shown anything cross stitch on the blog for about 18 months! After popular request, we thought that we might catch up. Ariel completed the first pattern: "Mother's Bliss" from Mirabilia Designs. It was Ariel's first large design and she did a very good job. All these designs aren't very hard or complicated - they are just large and you need to spend a lot of time to finish them. These were all framed last September and between Mum, Ariel and Lana we had 13 pictures framed. The framer we use is in Port Macquarie, about 8 hours drive away. When we plan a trip up North, we work out which patterns to frame, carefully pack them in a mailing tube and send them off. Then on the return journey we pop in the shop and collect them all. We suggested to Ariel that if she finished her Lady before we posted them we would pay for it with the rest. Lana stitched the other two BM (Before Martin). The first one on blue is "Stargazer" by Mirabilia pattern #88. She is stitched on 32ct "Bell Bottom Blue"from Stitches and Spice an Australian online hand dyed shop. I think this material is much better than the orange used for the official picture on the Mirabilia Site. There are a lot of beads on the design. I was on the lounge the other night looking up at the picture and making a number of "interesting" comments regarding the sheer amount of beads! It looks as if she has been shot by a stream of bubbles and is clutching her chest in pain. Lana didn't agree with me. I could tell this as she just gave me THAT condescending look. The last is "Angel of Hope" from Lavender and Lace Designs, stitched on the purple material "Jacaranda Haze" also from Stitches and Spice. Lana used beads instead of the gold thread petite on the dress and the larger ones around her. A "Biscornu" is what is pictured here. The word is a French adjective which is now a noun in English to describe for an odd shaped pin cushion. The Green one was done as an experiment, then Lana made the red one on 25 count material "two over two" (two strands of thread over two material threads) and the little blue one is one over one on the same material. You can see that one over one is 1/4 the size of the two over two. Clare's and Rose's fingers provide some scale. Lana has always wanted to do this to show the size comparison, and finally found the right pattern. The pattern can be found at Aurelle blog (It's in French but you should find your way around easy enough). The samples shown here are based on the "Biscornu No 8." pattern. Would I change my past? As I was lying in bed the other morning, in that half aware state between being asleep and awake, I was pondering how I would change my life going back with what I know now. But I kept getting stuck on a paradox. Every mistake that I tried to rectify would jeopardise the really good things that happened. The unlikely circumstances that led to my meeting and marrying Lana were too extraordinary to come about through planning of my part. By knowing and loving the Faith as I do now, I would have been unlikely to have met Lana. If we had done the wiser things financially, I wouldn't have learnt what I now know and probably wouldn't have ended up in the lovely country place we now enjoy. It seems that God really does draw straight from Point A to Point B using crooked lines. Then yesterday I was pondering life in front of the Blessed Sacrament giving thanks to God for all the blessings He has given me. We have come to realise that stable two parent families are not in the majority - neither here in Australia, our parish or in the US when we lived there. Even at the local parish with an attached "Catholic" school, only a minority of the children attend Mass and even less do so with both parents. We often make up half the children present. With all the dopey things Lana and I did and thought along the way, how did we end up where we are today? When we explain to the children the better way of courtship, life and love they ask us if we followed that advice. "No," we reply, "Unfortunately we weren't told, and maybe we wouldn't have listened. We didn't have any examples on which to base the correct actions. But it is much easier to learn from our mistakes than make them all yourself." Last night the children made the main meal of the day. Roast Lamb and potatoes, peas and carrots. Very tasty and Lana just had to answer a few basic questions. It is worth bucking society's general advice and focussing on having a faithful, fruitful family life. So I wouldn't change anything even if I could. The risk of not getting here is too great. This is quite a funny animated movie using Open Source software Blender. The quality is certainly as good as Pixar, although the storyline could use some better editing. The humour is reminiscent of Bugs Bunny/Road Runner vs Wiley Coyote and I would rate this as PG. The graphics are really very high quality and that makes the slap-stick/retribution style humour more intense. The children have watched it a couple of times already and want to watch it again. Danger! Danger! Hair in Range. Martin has found a new way to get his sisters' attention. He comes up behind them, grabs their hair and pulls. Today Martin came up behind Clare while she was sucking a lollypop. He grabbed her hair firmly in both his hands and she went over onto her back, Martin grabbed the lollipop stick and took it for himself. All in a quick one-two move. Naturally, he did not win the lollypop and was sorted out, but it has made reading on the floor a risky proposition. 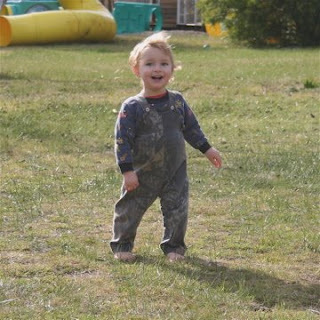 (Imagine a scene 20 or so years in the future, with Lana and I laughing at our grandson's activities and telling Martin, "Look at what you did to Aunty Clare when you were a baby. It's still on Bruggietales. Don't complain about your boys doing the same!" This photo is a re-enactment and we will now put a stop to this method. But this photo is a good record for posterity. 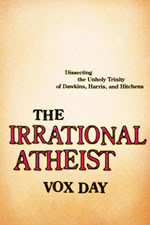 I have just finished reading "The Irrational Athiest" by Vox Day. This is a very insightful, yet amusing, dissection of the arguments made by the leading atheists, especially Dawkins, Harris and Hitchens. Vox Day runs the interesting and politically incorrect blog Vox Popoli and is always ready for a challenge. In The Irrational Atheist, Vox Day doesn't so much defend the Christian or Theist position. There is no need to. All he has to do is show that the Atheist position is so irrational that no rational person could be swayed by their arguments. I would summarise Vox Day's position as "The atheists are liars, bad liars and can't even manipulate statistics properly." One chapter covers the Inquisition, the Crusades and Human Sacrifice - all allegedly major problems that are laid at Religion's feet. I thought the best information was that children's bicycle accidents kill more people every year than the Inquisition ever did. 130 children's bicycle deaths per year verses 9 "victims" of the Inquisition per year. And as an aside, The Great Leap Forward by Mao Tse Tung killed 8,600,000 per year, but hey, that's not relevant. The book is well written and very easy to read in small or large doses. Vox Day is so confident in what he has written that he has challenged any self avowed atheist to challenge any of the arguments he has made in his book. The response has been loud and blustery, but of no consequence. You can read it for yourself by downloading it for free in a variety of formats at his blog or buy it from Amazon or other booksellers. Overall the book provides a great insight into the atheist position. The church's position has always been that as God made the world, it makes the most sense following God's laws for our actions within it. Any other position has varying shades of insanity - that is, a less than sane way of viewing the world.